Cathay Pacific has a lot of lounges in Hong Kong, but we decided to just go to the closest lounge with a first class section to our connecting flight, which happened to be the Pier. The Pier is undergoing renovations, though, so the first class lounge is closed, and they instead have a section of the business class lounged roped off for first class passengers. That being said, the service in the first class area was very attentive. There was a man patrolling the “entrance” to the first class area, and there was a person dedicated to serving the very few of us who were seated in the first class area to get whatever we needed. The Pier is quite large, and the lounge was pretty empty while we were there at night. I walked around to explore the food options, and they had some decent already-prepared food as well as a noodle bar, where I sampled the dan dan mien again. What can I say, I’m a sucker for anything deep-fried. And dan dan mien. After a 15-hour flight, a shower was at the top of my mind, and the shower rooms at the Pier are spacious and required no wait when I wanted one. This lounge had fast wifi, lots of seating, decent hot food options, and good showers. What more could you want? The service in the first class section was also really top notch. They were constantly clearing plates when you were done, they were willing to fetch anything (like when my noodle buzzer buzzed, I didn’t even have a chance to get up as someone volunteered to get it for me), and they were always using pleasantries. I was definitely impressed with the service in this lounge for first class passengers. This entry was posted in Cathay Pacific, Lounge Reviews, Travel, Trip Reports and tagged airport lounge, cathay pacific, hong kong, travel, trip report on February 22, 2014 by Edward. The Plaza Premium Lounge at Hong Kong airport is Plaza Premium’s flagship lounge, and it’s quite nice. The lounge is located amongst many of the other lounges like the Thai and Emirates lounges, and it’s just a short walk from the United Club. The lounge accepts Priority Pass, which is how I got access. Food options at the Plaza Premium Lounge were definitely superior to the United Club. The noodle and congee bars were legitimately tasty and of significantly better quality than the hot food options at the United Club, and I enjoyed that they offered boxed soy milk as a beverage. There was also quite a bit of seating of various types. There was a bar area that was completely empty, there were tables for eating, there was a relaxation/lounge area that was quite crowded, and finally, there was the area with single-person seats that was completely roped off for an unknown reason (possibly because they didn’t want to clean up a separate area when the lounge wasn’t that crowded). Overall, I enjoyed this lounge quite a bit. The food and drink options were good and local, there was ample seating, wifi was fast, and the lounge was clean. This is a great option for a long layover, and I’d happily choose this lounge over the United Club in Hong Kong. 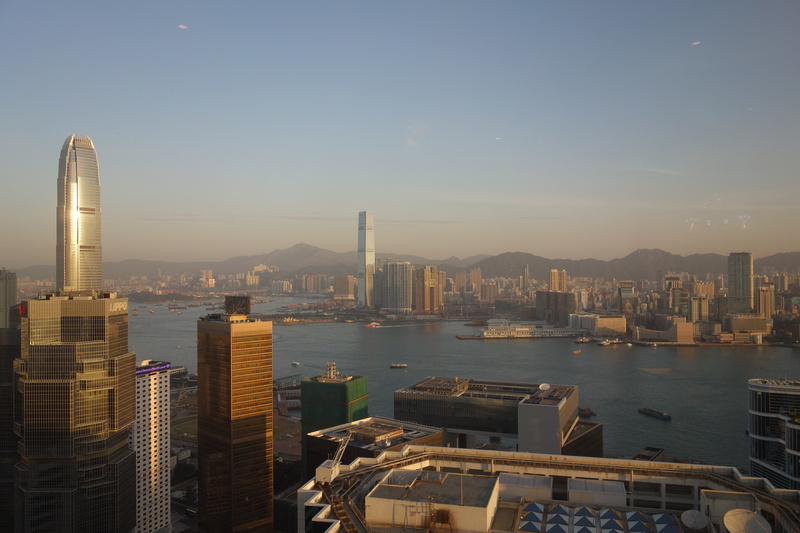 This entry was posted in Lounge Reviews, Travel, Trip Reports and tagged airport lounge, hong kong, priority pass, travel, trip report on December 23, 2013 by Edward. The United Club at the Hong Kong airport is supposed to be one of the best United Clubs out there, so I was excited to check it out when I flew out of Hong Kong back to the US. Upon entering the lounge, I asked to take a shower, as I got to the airport pretty early and didn’t have the chance to take one before I left. Since it was quite early in the day, the lounge wasn’t crowded at all and the shower was free, so the desk agent led me to the shower immediately. There’s only one shower available, so you might have to wait a while later in the day if you want to use it, but then again, Hong Kong isn’t a huge Star Alliance connection point. The shower room and the shower itself were large, and the water temperature and pressure were good. The only negative was that the shower room smelled a little funky when I entered. After showering, I checked out the food options, and I don’t think I’ve seen any United Club with more food offerings than the United Club in Hong Kong. There were a couple of salads, some snacks, pastries, several hot food options, and a sushi bar. The food wasn’t particularly good (the scrambled eggs looked disgusting, and the sushi was pretty terrible), but at least they offered more than just snacks, and I was able to put together a decent breakfast with the food offerings. The club also offers ample seating, or at least when I was there in that morning there was plenty of room. It did not feel overcrowded at all, unlike almost any other United Club that I’ve been to. There are also pretty nice views of the tarmac, if you like to watch planes. My only other complaint about the club was the wifi. Every 5 minutes or so, I’d have to reconnect as the wifi would cut out, and I’m not sure if I was the only person having the problem. But otherwise, yes, the United Club in Hong Kong is one of the nicest United Clubs I’ve been to, but that’s only because domestic airport lounges in the US are almost all not very nice. Compared to other international lounges, the United Club is decidedly mediocre in terms of the food offerings, but the space is nice, and I appreciated the views and ample seating. This entry was posted in Lounge Reviews, Travel, Trip Reports, Uncategorized, United and tagged airport lounge, hong kong, travel, trip report, united on December 19, 2013 by Edward. Here are some things that I did in Hong Kong that I very much enjoyed. Because I kept on procrastinating when I was at home, I was in desperate need of a haircut by the time I got to Hong Kong. Since I only let Asian people cut my hair and there are lots of Asian people in Hong Kong, I figured that I might as well try to get a haircut in Hong Kong. After Googling a little bit, I came across a chain called QB House. It’s a chain of barbershops that originated in Japan, and the idea is that you can get a fast, affordable haircut (QB stands for Quick Barber). They advertise that haircuts take only 10 minutes, prices are cheap, and that the chain has optimized the haircutting experience. To get a haircut, you can pay with a 50 HKD bill or use your Octopus card with the ticket machine, and then you get a ticket that you then hand to a barber. As soon as a barber was free, I sat down in the chair, quickly explained what I wanted, and then the barber started cutting. They don’t use water or do any styling, and the haircut took about 10 minutes. At the end, the barber also used a vacuum on my head, which I always appreciate. Dialogue in the Dark is an exhibition where you go on a tour in a pitch black area to experience what it’s like to be visually impaired. The tours are led by people who are visually impaired themselves, and you engage in experiences that you might find in Hong Kong like trying to cross the street (don’t worry, there aren’t any actual cars). I was a little bit skeptical of Dialogue in the Dark, since I’ve previously been to a restaurant called O.Noir in Montreal where you dine in the dark and all of the servers are visually impaired and did not think it was a great experience (well, largely because the food wasn’t very good), but Dialogue in the Dark blew me away. The tour guide was awesome, and the experience was–for lack of a better term–eye-opening. This was one of the best and most enjoyable exhibitions I’ve been to. I visited a wet market in Wan Chai, and it was kinda awesome in a horrific way. In the US, it’s common to be very disconnected from where our food comes from, but at a wet market, it’s extraordinarily clear that what you’re eating comes from a live animal that someone has to kill. I spent quite a long time just staring at the myriad fish stalls. Some stalls had fish cut open where the fish were so freshly killed that the fish hearts just kept on beating. And as people were pointing at fish and buying them, the fishmonger would just grab the fish, put it on his stone slab, snap its spine, descale the fish as it was still wriggling around, then slice it open. Gory and bloody but so very real. I wonder how many people in the US would keep eating meat if they had to see the animals killed in front of them, or better yet, they had to kill the animals themselves. This entry was posted in Travel, Trip Reports and tagged hong kong, travel, trip report on December 18, 2013 by Edward. Here’s a sampling of things that I ate in Hong Kong. You’re not going to find anything gourmet here, but I do think it’s an interesting experience, especially if you come at 4:30am as I did on my first jetlagged morning in Hong Kong. Tsui Wah is a chain of restaurants that are essentially diners, so they’re popular with the drunk crowd late at night (the location that I went to in Central is open 24 hours). I went to the Tim Ho Wan in Sham Shui Po, One Dim Sum near Prince Edward MTR, and Dim Sum Square in Sheung Wan for dim sum during my stay. All were good and cheap and better than anything that I’d had in the US, but I wouldn’t say any of them was phenomenal or a must-eat, and I still can’t believe that Tim Ho Wan and One Dim Sum have Michelin stars. The best item was (of course) the BBQ pork buns at Tim Ho Wan (Dim Sum Square had a very similar version). Rather than the steamed or baked versions that are common in the US, these have a sort of snowball-fried-sweet top, and it’s unlike anything I’ve ever had before. It’s light and airy yet fatty and sweet. It does get a little too sweet-on-sweet for me, as the bun is quite sweet and the filling is also sweet so it gets to be almost cloying. Other items that I tried included turnip cake, sponge cake, and rice noodle rolls, but none of the other items that I tried were that much better than what I’ve had elsewhere. I definitely wouldn’t wait more than half an hour to eat at any of these places. For what it’s worth, I was seated immediately at Tim Ho Wan, although I went relatively early in the morning. This place was recommended to me by a friend, and it was also mentioned in the NYTimes somewhat recently. As such, it’s pretty popular and waits can be quite long, so plan to get there early. This restaurant is a restaurant that I’d expect to find in a place like San Francisco or New York: much of the waitstaff is not Chinese, menus are completely in English, and prices are high. It’s a yakitori place, so think skewers of chicken. I had the waiter order for me, and I ended up trying the eggplant salad, sweet corn tempura, meatball, heart, rib, and korean fried cauliflower. All of the food was flavorful, but I got a little bored with some of the flavor profiles quickly. In particular, the most lauded dishes of sweet corn tempura, meatball, and KFC were all pretty one-note. Flavorful, yes, but interesting, not really. Coupled with relatively high prices (my food was ~$50 for not that much actual food, and it’s Hong Kong, where you can get a meal for <$5), it’s not a place that I’d highly recommend, but it’s worth trying. This was another place recommended by a friend, and I really enjoyed the simplicity of good BBQ pork on top of a bed of rice. This place isn’t fancy and it’s crowded and busy and you won’t have enough space and there’s no English, but it’s good food (and it’s cheap). Get a plate of whatever meat you want on top of rice (the recommendation being BBQ pork, of course), pour the special sauce on top, and enjoy. A similar place that I enjoyed was Yat Lok, although I missed out on the roast goose because I was there too early, but my bowl of noodles was just simple and tasty. If you want an authentic dining experience in Hong Kong, brave the lines and eat at Australia Dairy Company (don’t worry, the lines move quickly). There are hordes of people inside and out and tons of workers moving people quickly through the restaurant. They even have English menus (or they at least have one), but it might take a while to get to you. They’re known for their scrambled eggs and egg custards. I’m not sure they’re the best scrambled eggs I’ve had (that distinction probably still lies with Gartine in Amsterdam), but the food was tasty, and it feels like you’re part of Hong Kong’s bustle when you’re squished into your table with people running around, sharing a table with strangers. I’ll be honest, I was disappointed with egg tarts in Hong Kong. The egg tart I had from Lillian’s in Shanghai was better than the egg tarts I tried from Tai Cheong and Honolulu Coffee Shop. What I wasn’t disappointed by were the desserts at Cong Sao and the drinks at Hui Lau Shan. Cong Sao has lots of desserts that are variations of tropical fruit (e.g. mango, durian) with potentially frozen things (e.g. shaved ice) and probably gelatinous things (e.g. mochi, boba, but not those things). Hui Lau Shan also has some of those things, but they’re better known for their ridiculously tasty and refreshing and sweet-but-not-too-sweet drinks. Hong Kong has lots of good, cheap food. They also have some very, very expensive food that I did not try this time around, but I will try to get to some of those places on my next trip. I was kinda expecting more things to just blow me away like what I ate on my trip to Shanghai, but perhaps it’s just because I’m more familiar with a lot of the foods I ate in Hong Kong that I was a little less impressed. This entry was posted in Dining, Travel, Trip Reports and tagged dining, hong kong, travel, trip report on December 17, 2013 by Edward. To get to the Conrad, I ended up taking an airport bus (in this case, bus A11) to Admiralty station, and then walking through the mall at Admiralty to get to the hotel entrance within the mall. Depending on where you’re staying, an airport bus might be a better choice than the Airport Express as you don’t need to transfer and the bus might stop closer than the nearest MTR station. At check-in, I was informed that I was upgraded to the Executive Floor, which meant that I had lounge access for my stay, although I didn’t use it except for breakfast. The room was nice and plenty large for just myself. As I walked in, I was a little surprised that the lights and TV were already on, but there was a welcome message on the TV for me. There was also a small welcome amenity of some fruit and chocolates. The bathroom had two sinks, separated toilet, and separate bath tub and shower. When I first walked in, the room smelled a little funky, like maybe it was a little moldy from all of the humidity, but it went away as the air conditioner chugged on, and I didn’t end up noticing it too much past the first 5 minutes or so I was in the room. Breakfast in the Executive Lounge was good, although depending on when you went, it was quite crowded. I mostly enjoyed the food largely because of the spread had fresh fruit (and not just melons) as most of the food I ate in Hong Kong was devoid of fruit and vegetables. The service in the Executive Lounge didn’t feel particularly special (or even welcoming) to me, nor did the service of any of the people I interacted with, from the check-in desk to the concierge. Nothing was bad per se, but I expected more from a hotel that retails for over $500 per night (although according to one of my friends from Hong Kong, it’s unreasonable to expect good service in Hong Kong nowadays). I will say that my room was absolutely silent when I was there; I never heard housekeeping staff or other guests or noise from outside. The location of the Conrad is also convenient, although not quite as close to the MTR as you would think given that it’s technically connected to the Admiralty MTR station, and Hong Kong is so well-connected via public transit that I think location is somewhat less important in Hong Kong than in other cities. This entry was posted in Hilton, Hotel Reviews, Travel, Trip Reports and tagged hilton, hong kong, hotels, travel, trip report on December 16, 2013 by Edward. I am currently in Hong Kong for vacation. This is my first trip to Hong Kong, but I leave tomorrow so I can be back in the US to be with my family for Thanksgiving. Here are some random initial thoughts, and I will expound upon some of them in future posts. 1) The Conrad Hong Kong is nice, but I don’t think it’s $500+ a night nice. Who is paying cash for hotels like this? That being said, I think it was a good choice to burn the free weekend award certificates that I got from the Citi Hilton Reserve credit card. 2) Hong Kong has one of the best public transportation systems I’ve used. The MTR is cheap, clean, fast, and runs ridiculously frequently. The ding ding trams are wonderful, as is the Star Ferry. Octopus is also super convenient, and it’s cool that you can use it at so many places. Why can’t other cities get this right? 3) I was so excited to eat in Hong Kong, but I’ve honestly been a little disappointed. This is just likely a case of overly high expectations, but places like Tim Ho Wan and One Dim Sum, which are the cheapest Michelin stars to eat in the world as far as I know, just did not impress me that much. But I do find it remarkable that you can get generally very tasty food for less than $5. I will try to have a real post ready for tomorrow. This entry was posted in Musings, Travel and tagged hong kong, musings, travel on November 27, 2013 by Edward.